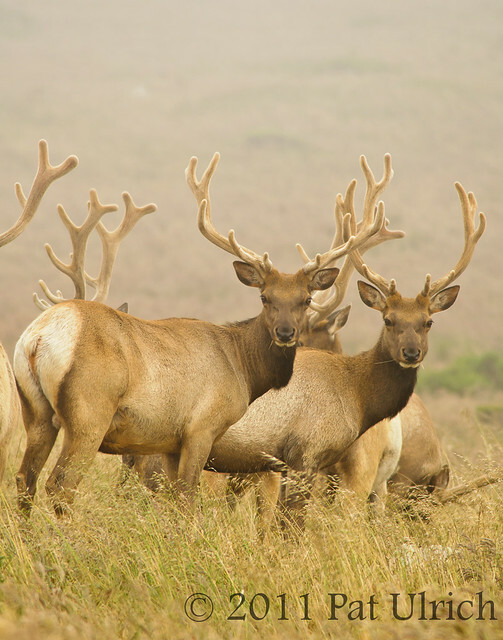 This herd of tule elk bulls was enjoying a dinner of tall, blooming grasses when I encountered them on Tomales Point in Point Reyes National Seashore. Through the shifting fog I watched them graze on the grasses and occasionally push each other out of the way. Every now and then a few would look my way, which made for better pictures since I could get some eye contact with them. The two looking at me in this frame are average sized, but there were some very large bulls in the group as well. Even though they all still had velvet on their antlers, you could already tell that the smaller bulls respected the larger ones, as they often parted ways when the big guys were coming through. Very nice. I like how the light works along the edges of the antlers, outlining them. Just unbelievably beautiful animals! and stunning photo . . .
Not only the composition is great but also the colours are just beautiful. What a magnificent shot!